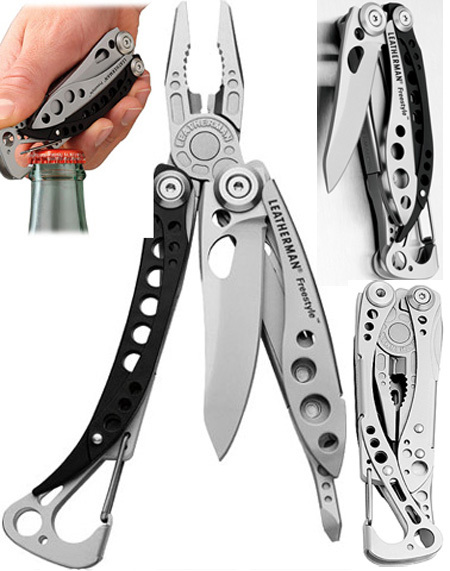 Not satisfied with the mere five ounce weight of their new Skeletool, Leatherman is planning the release of an even lighter and more stripped-down multi-tool, the Freestyle. The Freestyle is heavily based on the Skeletool, and it’ll feature a 420HC straight blade, lightweight pliers with wire cutters, a combination Phillips/flat driver, and a hybrid bottle opener/carabiner. 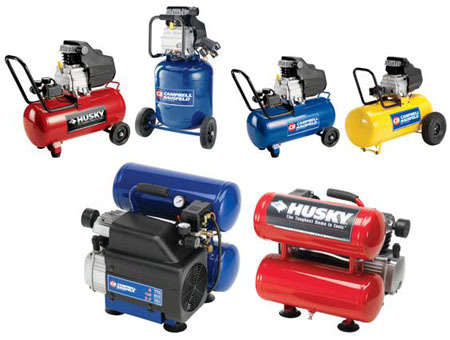 Campbell Hausfeld is recalling several compressor models after 11 fires were reported. The recalled compressors pose a fire hazard due to improper motor coverings that can ignite during use. The affected products include certain Campbell Hausfeld and Husky compressors sold between July 2005 and November 2007. 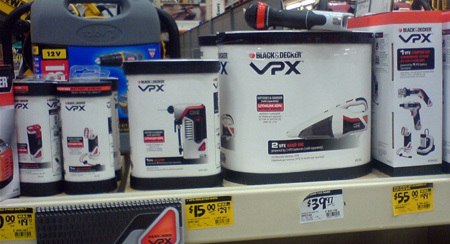 Black and Decker’s VPX tools and accessories are hitting the clearance bins at many home improvement stores less than four months after the products’ initial release. It seems that some stores simply removed their VPX stock from display, but others, such as the Home Depot shown above, are offering their leftovers at a sweet discount. While we wouldn’t recommend these tools for heavy-duty work even at clearance prices, they’re decent homeowner-grade products that you may want to keep an eye out for, next time you’re at the store. Although I’ve heard rumors that the VPX system has been discontinued, several online stores and discount retailers are still offering a variety of VPX tools and add-ons at full price. Many thanks go to MrsMcDreamy at Slickdeals.net for sharing the above photo recently taken at Home Depot. 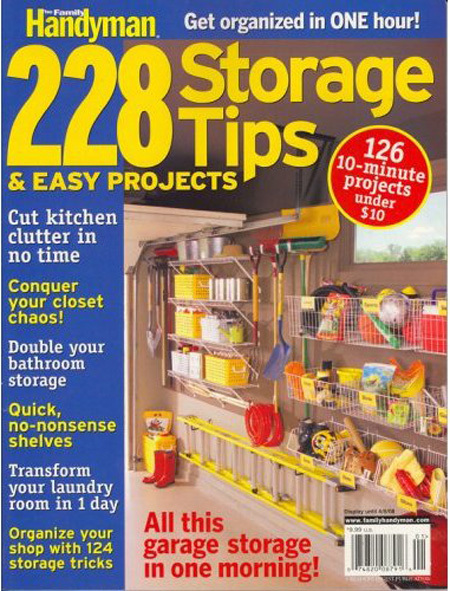 228 Storage Tips And Easy Projects packs into its 144 pages lots of great storage ideas for your home and workshop. The book describes and illustrates every project in detail, making it quick and easy for handypersons of all skill levels to follow. Even better, most of the featured projects require low-cost supplies that you may already have in your scrap pile. A miter lock router bit cuts matching tongues and grooves into a workpiece to create a strong angled joint. Not only does this bit increase the glueable surface area of a joint, but it also automatically aligns the opposite pieces, reducing the need for special clamps. You can use the common 45° bit to create parallel or perpendicular joints, for such projects as drawers, boxes, and frames. Leatherman makes this bit driver extender/adapter for the current generation of multi-tools and knives which accept Leatherman’s proprietary removable bits. The bit extender increases the tools’ reach by 3-1/4″ and accepts both Leatherman’s unique flattened bits and standard hex bits. This greatly expands the driving capabilities of these tools since the flattened bits are costly, in limited variety, and sometimes hard to find in a timely manner. Until February 13th, Sears is offering free shipping on portable power tools, power tool accessories, and mechanics tool sets. Select ratchets and wrenches also qualify for the promotion, but we’re not sure how eligibility is determined. 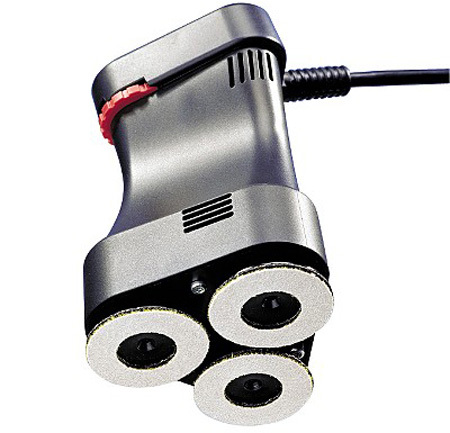 Also, until 2/9/08, Sears will throw in a free 3D sander for all tool purchases over $49. The standard exclusions apply — Sears will ship “mailable” products via the cheapest method to the 48 states, and orders shipped via freight will carry delivery fees. A few words of warning about Sears’ shipping: You can’t cancel an order once it enters the “processing” stage, and Sears’ shipping department occasionally runs into inexplicable delays. If you need a tool urgently, pick it up at the store, or purchase it elsewhere. 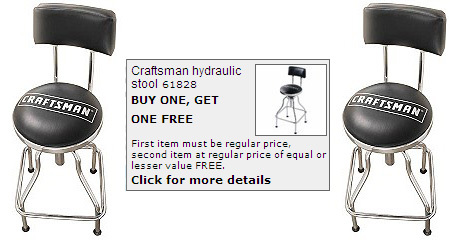 Sears is holding a “buy one, get one free” sale this week on a few select items, including their durable hydraulic stool. With a padded and adjustable seat and backrest, it’ll keep you comfortable and productive during your longest projects. This stool is all about the details — even the feet are adjustable to compensate for uneven surfaces. For $80, less cash than for a task chair, you get two stools appropriately sized for the garage or shop. This deal would be a lot better if the stool was discounted by 50%, but with two for the price of one, now might be a good time to start shopping for Father’s Day. You can also get the two-for-one deal on a few other items: a 10″ steel saw blade, a five piece Companion screwdriver set, and a 13″ tool bag. Since I have nothing nice to say about those items, I’ll leave it at that. To check out this week’s promotions, take a look at the Sears Book flier, linked below. If the link doesn’t work at first, enter your zip code and try again. 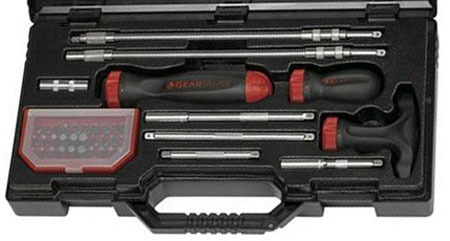 GearWrench, well known for their ratcheting wrenches, also offers a nice line of configurable screwdrivers. Instead of just selecting the proper bit for a fastening task, you can choose which shaft and handle to use as well. GearWrench’s screwdriver handles also feature ratcheting mechanisms, which make these drivers even more appealing. Stanley built its economical and compact 4-in-1 pocket driver for both precision and general-purpose applications. The precision tips on one of the magnetic double-ended bits will fit the small fasteners found on eyeglasses, toys, battery compartments, and other such devices. You can use the larger, more commonly used tips on the other bit for on-the-go tasks or quick jobs around the house. The pocket driver’s handle, textured with contrasting materials, provides a comfortable non-slip grip. With a street price of $3, it wouldn’t hurt to buy several pocket drivers, one each for your home, vehicle, and workplace.